You’ve probably got a pretty good idea of what the Hulk’s up to these days, what with the gigantic World War Hulk crossover finally wrapping up last week. Well, if you’ve already finished the final issue of that series, prepare to take a step back because Incredible Hulk #111 takes place between issues 4 and 5 of World War Hulk. Not that this story is much more than an addendum to that larger picture. 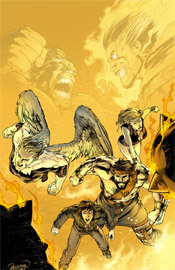 The Hulk himself only appears fleetingly throughout the issue, with the focus squarely on the ragtag team of Namora, the Angel, Hercules and Amadeus Cho. They’re basically on cleanup duty, wrapping up the loose ends from the Hulk’s fight with Dr. Strange a month ago. Evidently, when Strange’s demon-possessed body was defeated in World War Hulk #4, Zom (the demon in question) was freed to search for a new host. Naturally, we can’t have a mace-fisted monster roaming the streets of New York, so the four renegades set about containing him before he can wreck too much more of the city’s infrastructure. Although the storytelling directly relates to his adventures, it’s a tough sell for an issue of the Incredible Hulk to be so completely barren of the Hulk himself. Granted, when Brian Bendis wrote a recent issue of Ultimate Spider-Man in a similar fashion, focusing exclusively on the Green Goblin and only spending a courteous page and a half on Spidey, I loved it. There’s a difference here: in that issue of USM, the story set up and enhanced an obvious future collision. No matter what, you knew that at the end of the day that story would make the eventual clash of the two characters that much more important. But in this instance, the Hulk has already dispatched of the enemy. The story expands on a battle that took place a while ago, and that’s just not as exciting to read. It’s a somewhat interesting aside, set against the backdrop of the Hulk’s assault on New York, but it would’ve been better relegated to a mini-series spinoff like World War Hulk: Front Line. I’d expect Incredible Hulk to be right at the heart of the warzone, not on the sidelines cleaning up the spillage. Leonard Kirk’s artwork is just mediocre. Where Zom was a menacing behemoth in the hands of John Romita, Jr., he’s fairly passé here, like a heavier, spikier Ghost Rider without his bike. To his credit, he tells a very aggressive, detailed story with a limited fuss. There’s a lot happening on every page of this issue, but his work never seems overly complicated or hard to read. It’s clean and professional, if not particularly exciting. If you’ve found yourself completely absorbed by the WWH saga, this is a nice expansion upon that main storyline. It serves to reinforce just how big a deal it was for the Hulk to take out Dr. Strange’s possessed form, and by that merit alone works as a nice extra source of information within the grand scheme. As its own standalone title, though, it’s really nothing worth getting excited over. Fans unfamiliar with the giant crossover will have a lot of reading to do before this issue makes any sense, and even those up-to-speed on the proceedings may deem these events to be needlessly extraneous. Flip through this in the store, it’s not garbage but it’s also nothing exceptional.